Legião Urbana (lit. 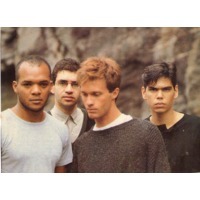 "Urban Legion") is one of the most successful rock bands in Brazil's history. Originally created in 1983, the band continued to exist until 1996, with the death of its vocalist, Renato Russo. Renato Russo (born Renato Manfredini Jr.) created Legião Urbana in 1982, in Brasília, after his short presence in an earlier band named Aborto Elétrico ("Electric Abortion"). Aborto Elétrico ceased to exist due to repeated disagreements between Russo and the brothers Fê and Flávio Lemos. After Aborto Elétrico split and Russo created Legião Urbana, the two brothers would also go on to form another very popular Brazilian rock band, Capital Inicial, which remains a success to the present day, but still behind what Legião Urbana accomplished. Curiously, some famous earlier songs of Capital Inicial were written by Renato Russo. Legião Urbana was initially formed by Renato Russo, Marcelo Bonfá (drums), Eduardo Paraná (guitars) and Paulo Paulista (keyboards), but Paraná and Paulista would quickly leave the band. Dado-Villa Lobos replaced Paraná as the guitarist. In the beginning of 1985, Renato Rocha joined the group as the bass player, after Renato Russo couldn't play any instrument because of a suicide attempt that injured his wrist. Renato Russo would then focus on the vocals. Many elements helped shape the identity of Legião Urbana. Consciously or not, Renato Russo was heavily influenced by The Smiths and U2, particularly The Smiths lead singer Morrissey, with his extremely personal lyrics and idiosyncratic on-stage performance. He was also influenced by Joy Division's Ian Curtis. Thematically, Russo and the other members were also influenced by literature, especially that of Portuguese poet Luís de Camões, whose poetry is featured in more than one of the band's songs.